Use vinegar to clean away the scale that forms at the base of your kettle or around your showerhead. The acid in vinegar makes it a great all-round cleaner, and it’s also what makes it an ideal natural descaler. Use the cheapest vinegar you can find. Pour this into your kettle and leave it overnight. The next day, pour the vinegar back into its bottle – you can keep it and reuse it for descaling, it’ll work time and time again. Just remember to label the bottle so you don’t mix it up with the vinegar you use in your food! 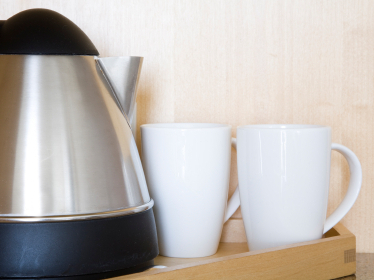 You’ll see that your kettle is sparkling and scale-free once you’ve treated it with vinegar overnight. Rinse it out well, and boil a couple of kettles of water to remove any traces of vinegar before using it again. You can also put your showerhead in a bowl of vinegar – again, it’s best to leave this overnight. The vinegar will clean away any scale that builds up around the water holes in your shower head. It’s good to do this regularly (every couple of months) as blocked holes in your shower head can actually cause water temperature fluctuations, which are never pleasant in the shower! As with the vinegar you use for your kettle, you can re-use vinegar descaling the showerhead. Find out how vinegar is also a great all-round kitchen and bathroom cleaner. Lemon juice is also good for descaling.